Almost everyone has seen an image of palm-tree lined Rodeo Drive in Beverly Hills, California. The royal palm is one of the most recognizable palm trees and instantly brings to mind the idea of tropical climates and sandy beaches. A tall and grand species of palm tree, the royal palm can be found in many areas of the world, including various southern coastal American states. The royal palm tree is one species in the palm tree family, scientific name Roystonea Regia. The royal palm can grow to between 80 and 100 feet high, with a growth rate of about 1 foot a year. The royal palm is crowned at the top with long leaves that can reach up to 3 feet in length. This palm has small purple fruits that are inedible, and flowers in the summer with yellow blooms at the crown. 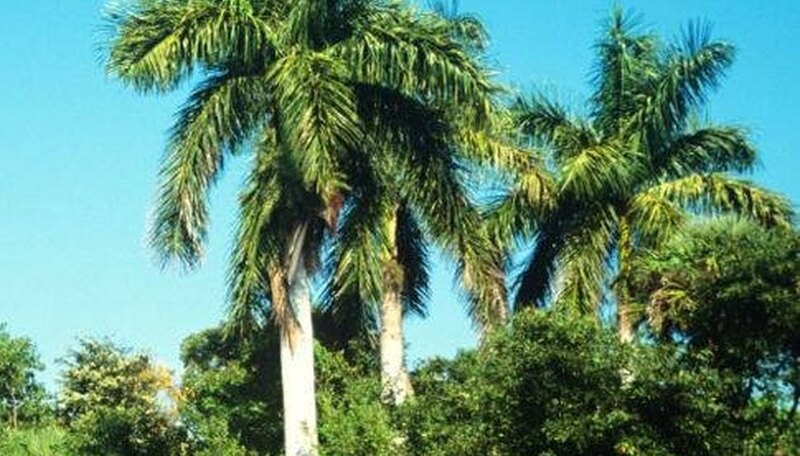 The royal palm grows in Central and South America, the Caribbean, and parts of California, Florida and Texas. The royal palm is an evergreen tree in tropical locations, and likes warm conditions, full sun and water. The royal palm tree's main insect enemy is the royal palm bug, which likes to feed on young palm leaves.